Incumbent U.S. pay-TV service providers would rather forget 2013 -- since it will be remembered as one more year where the major MSO cable operators collectively reported hundreds of thousands more video subscriber disconnects and service downgrades each and every quarter. In urban markets throughout America, price-sensitive consumers abandoned traditional pay-TV service and turned to a combination of free over-the-air broadcast digital television and subscription streaming OTT video entertainment offerings -- such as Netflix and Hulu. In some markets Telco challengers gained new pay-TV subscribers with limited-term lower-price service bundle promotions. However, once the promotions expire, some of these subscribers fail to convert to full-price customers. The story is very similar in other saturated markets all around the world. Infonetics Research released findings from its latest "Pay TV Services and Subscribers" market study and associated report -- which forecasts and analyzes the cable TV, satellite TV, and telco internet protocol television (IPTV) services markets. "Telco IPTV operators AT&T, China Telecom, and Deutsche Telekom continue to enjoy strong growth in new subscribers and ARPU, showing that competitive providers with differentiated services can successfully steal share away from incumbent cable operators," notes Jeff Heynen, principal analyst for broadband access and pay-TV at Infonetics Research. According to the Infonetics assessment, whether it's an improved user interface, multi-screen video, or even DVR services, there are marked differences that have allowed telcos to grow their subscriber bases at a time when other pay-TV providers aren't growing at all. Worldwide video service revenue, including cable and satellite pay TV and telco IPTV, grew again in the first half of 2013 (1H13), to $110 billion, a 2 percent uptick over the second half of 2012. Telco IPTV and satellite revenue continue to rise, thanks to new subscribers and increased ARPU in the critical regions of North America and Western Europe. Meanwhile, cable revenue market share fell another percent in 1H13, primarily due to a slowdown in subscriber growth in the lucrative North American market, where video subscribers are declining at a pace of 1.5 to 2.5 percent annually. The dominant satellite service provider, DirecTV, remains the pay-TV revenue market share leader in the first half of 2013. 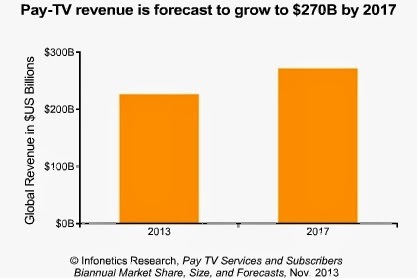 By 2017, Infonetics expects the global pay-TV market to hit $270 billion, a 2012-2017 compound annual growth rate (CAGR) of nearly 5 percent.